Ferdinand has a poorly thought out plot based upon the charming 1936 kids' book The Story of Ferdinand, of a gentle bull who would rather smell flowers than fight. John Cena does a fine job bringing the main character to life but his charming portrayal is buried under lazy writing, unappealing side characters, and an inconsistent universe. Little kids will get a kick out of it but it will quickly fatigue the older siblings and the attending parents who bring them. Every animated movie works within its own universe. 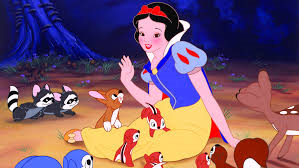 For example in Snow White the animals acted like animals – kind of in tune with the leading lady but behaved much like the furry critters you or I might run into. 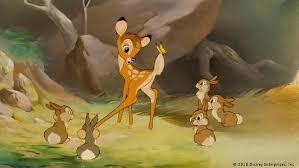 In Bambi or Finding Nemo the animals were again confined to animal limitations but the story was seen from their POV so we, the audience, could understand what they were saying and their mental capabilities were anthropomorphized. Mickey Mouse, however, was an entirely different perspective. He stands up straight, wears clothes, speaks and actually has a pet. He and his friends are, basically, humans who look like animals. 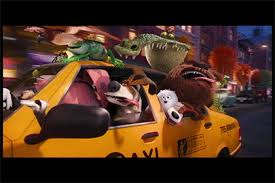 They drive cars, have opposable digits, live in human styled homes and speak the Queen's English. Bugs Bunny is, again, another species. These guys are animals – they are hunted and it would not be considered murder – by Elmer Fudd (that is if he could ever catch the loveably infamous bunny). Bugs lives in a hole in the ground which he has dug, though it has rugs and chairs. 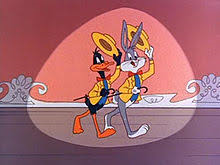 Bugs not only speaks and walks on his back legs, wears clothes when the occasion demands it – though he usually sports only his "natural" fur – but he outsmarts every human that appears on the scene, plays a ukulele, makes snarky comments, coins witticisms and can do things nothing on Earth can. He can tunnel through the Earth at breathtaking speed, and survive falls and impacts which in a more realistically created world no living creature would survive. His movements can be unnaturally fast when the need arises at a speed Superman would admire – changing clothes, moving from one place to another, conjuring any number of Acme items to fit the needs of the moment – in seconds. In short, come to think of it – Bugs is not just ANTHROPOmorphized. Bugs is SUPERANTHROPOmorphized. In other words, Bugs is a creature not just given HUMAN attributes but envisioned with SUPERhuman attributes. Bugs is Superman and Harry Potter wrapped up in a fuzzy New York accented bunny rabbit suited con man. All these worlds are very different from each other. 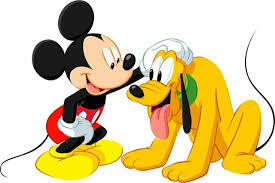 And aside from the outliers, like Pluto in the Disney world – who acts like a regular normal, though unusually intelligent, dog, despite the fact Goofy is also a dog but anthropomorphized – these worlds generally do not merge. I am a science fiction fan and am willing to accept all manner of outrageous premises…….IF the creators stay within the confines of the Universe they have created. 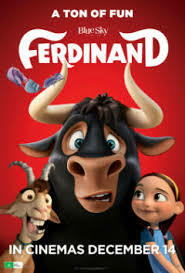 The problem with Ferdinand is that the writers couldn't decide on the parameters. It was the same problem had with The Secret Life of Pets. In both cases animals were established as normal creatures living with humans. 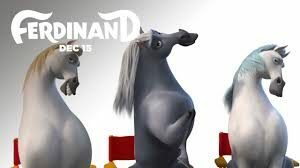 They were assigned the normal limitations of animals supplemented by the extravagant definitions allotted through serendipitous and impossibly well timed environmental factors. They could, for example, blithely depend on perfect balance and the timely arrival of things such as clotheslines and moving girders to keep them aloft if they chose to scale down several stories of a building but they had trouble opening human doors without opposable digits, etc. BUT when Max, a terrier gets lost they come across a gangster bunny who can carve fully functional keys out of a carrot by chewing on them AND turn the key in the lock and other creatures can drive cars – completely outside the parameters of the universe they established. 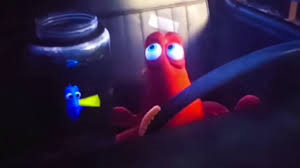 Finding Dory made the same mistake- by stepping outside of the rules of its universe. And so it its with Ferdinand. Bulls and dogs and goats and hedgehogs act more or less according to their natural limits, and although we can understand them humans can not…that is until the writers paint themselves into a corner. Then suddenly critters can drive, convincingly do the hula in front of humans, and do a creative coordinated dance off including breakdancing with horses. One minute Ferdinand can not roll across a yard in imitation of a hedgehog, the next he is Moonwalking. This makes no sense. In addition, the side characters, who in other movies so often steal the show, are off putting. The competitive German prancing horses next door act like an effeminate Nazi with his two fawning groupies. They gratuitously insult the bulls without context, purpose or wit. The goat, Lupe (Kate McKinnon), I assume is supposed to be their version of a "Dory" character – clueless but well meaning. Instead she is disgusting, creepy looking, annoying and unappealing. She drools, eats things then throws them up, attracts flies, sports two eyes that make her appear dead, has two protruding bottom teeth, and says offensive, occasionally inappropriate things. 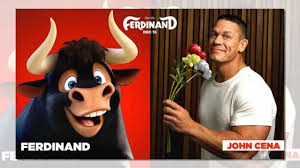 The character of Ferdinand himself as voiced by John Cena is charming. 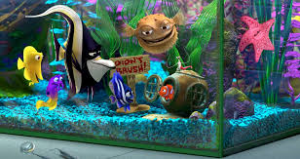 I would love to see a sequel with this character but only with a far better script and almost none of the side characters. 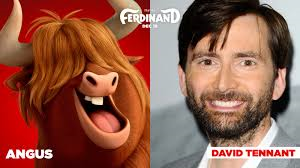 I did like Angus but am biased because he is voiced by my favorite Dr. Who persona – David Tennant – in full Scottish brogue. And for all you sports fans Peyton Manning does the voice of Guapo. In addition, the story leaves practical holes not really filled. 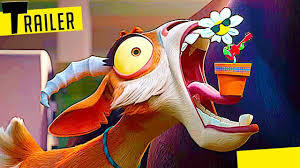 Once Ferdinand escapes the bullring and his friends go to his home farm: HOW could a simple flower vendor feed all those enormous animals? 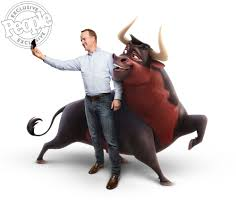 Wouldn't the departure of his entire stock bankrupt the bull trainer? Even if Ferdinand used reward money (which we are never shown he gets so we're really spitballing here) for "defeating" the matador won't the bull trainer simply buy more bulls with it who will be doomed to the same fate Ferdinand and his friends escaped? I know it's only a kid movie but those hanging points could have been EASILY dealt with even if only in credit sketches: the flower vendor hiring the bulls out to plow. The bull trainer turning his business into a petting zoo. I know it's just a kids' story but these loose threads were a distraction. The writers should have done SOMEthing to bring closure to this story. 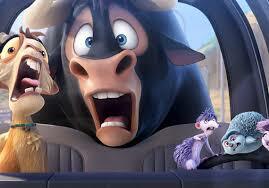 In short – there's nothing really WRONG with Ferdinand. But there's not much really right with it either. Go read the book instead.